Continuing from yesterday's post, here are some other resources I found in my search for independent bride imagery. Bust Magazine, the magazine of record for the indi-woman, in which we advertise ModernTribe, sponsored an event called Unbridaled in Philadelphia on January 10th. Now, this is the kind of wedding expo I wish was around when I was planning my wedding. If you live in Philly, they have a list of Unbridaled vendors for you to check out: everything from independent bakeries, florists, photographers, dress designers, stationary designers -- all, I assume -- who will cater to your off-beat style and won't try to sell you bows and roses (unless, that's what you want, of course). Also, somehow I found myself here at Offbeat Bride whose tagline is "Alter your thinking." 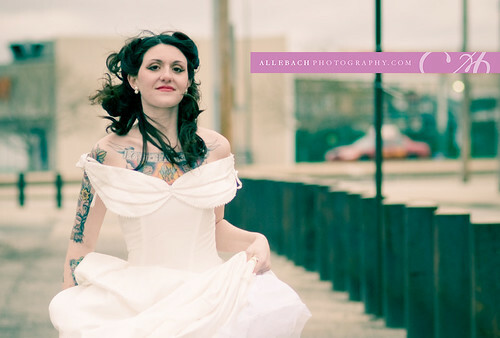 Ariel Meadow Stallings, the founder of the site, has a book too: Offbeat Bride: Tafetta free alternatives for Independent Brides and an alternative community to The Knot: Offbeat Bride Tribe.